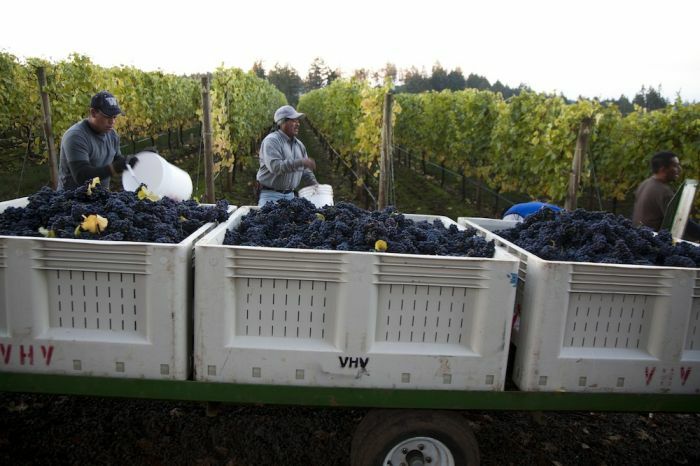 Winemakers were pacing the vines, checking the weather reports constantly, hoping sunshine would prevail for a spell—just long enough to goose the sugar level in this Pinot noir harvest. At Vista Hills Vineyard, winemaker Dave Petterson was beyond his comfort zone. It was already weeks beyond a typical harvest date and yet the crop hung in the cool fall rain and fog. If he waited much longer to pull the grapes, frost would kill them. 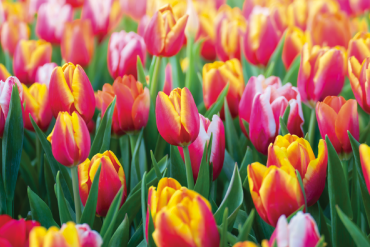 If he picked them now, they could miss a couple of crucial days of sun. It was nearly November. This multi-million-dollar crop dripped with the heightened possibility of failure. 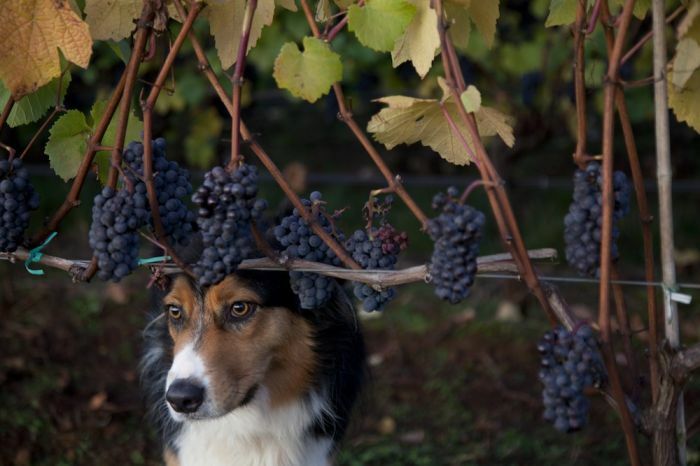 Through September and October, an anxious waiting game began across Oregon’s 850 vineyards and 20,000 acres of grapes. Sugar levels remained stubbornly low. “It was crazy how not busy we were,” Petterson says. At Adelsheim Vineyard, interns from abroad came on work visas to learn the winemaking business during a harvest. Their visas expired, and they left receiving little more than learning patience and how to clean idle implements. The prior year was a tough one, too. In 2010, grapes on the vine broke into bloom perhaps two weeks later than most viticulturists wanted, setting the farmers’ internal clocks forward to when the first fall frost might come. True, this is Oregon, where people talk about the unpredictable growing season with the same lack of alarm as Tuesday. For farmers, though, the weather can mean feast or famine. Behind the scenes at Oregon’s latest wine crush on the books, activities resembled the many harvests that preceded it, but, in some respects, this year was unlike anything winemakers had experienced before. 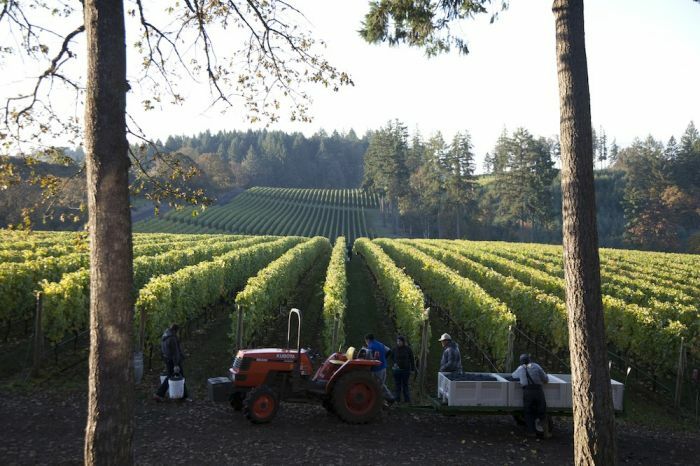 After the biggest gamble of many winemakers’ lives, the harvest began in the Pacific Northwest. In McMinnville’s Pinot Quarter, or what winemakers affectionately call the “Pinot Ghetto,” grapes arrived at a grouping of warehouses, grain elevators and other buildings, which were once dedicated more to carbohydrates than to grapes. Among the wines produced here are Panther Creek, R. Stuart, Domino IV and special one-off projects of winemakers in a couple of nondescript buildings. Panther Creek’s production facility is a handsome 1923 McMinnville electric station constructed with brick—yet showered with light from two knee-to-roof arching train depot windows. The mood is remarkably upbeat. This facility houses a commune of winemakers and industry workers this time of year. There is Michael Stevenson, who makes wine for Panther Creek; Petterson and Mark Stock, who make wine for Vista Hills; Martha Karson, a retired psychology professor from Michigan State University who works with Vista Hills; and Robert Blasier, a traveling winemaker with a goal of making six wines in five different countries. 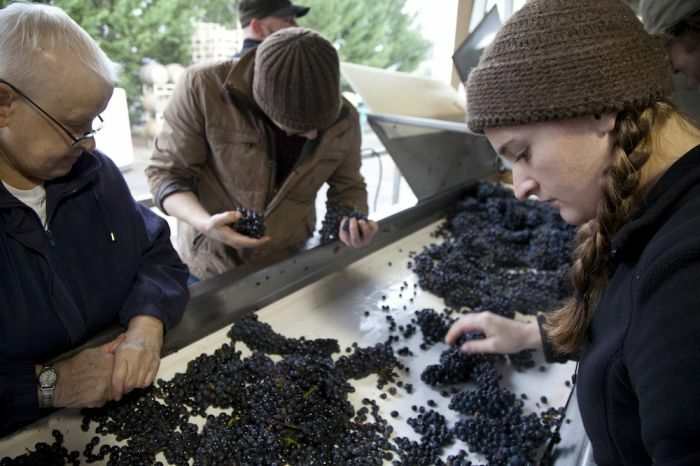 It is now November 2nd and the latest harvest in the fifty-year modern history of Oregon winemaking is finally under way—all part of a crush tradition thousands of years in the making. One of the earliest incarnations of a wine crush dates to 4,100 B.C in Migdal Haemek, a small village in northern Israel. In January 2011, a team of archaeologists from University of California at Los Angeles, working with Irish and Armenian scientists on the site, discovered a rectangular basin with a small ledge on the uphill side and drainage holes on the downhill side. The international team had found what they believe to be the world’s oldest wine press. In the first gravity-fed press, these ancient people stomped grapes with their bare feet. The grape juice would flow downhill and into a collection basin through holes that were stuffed with grasses and bushes that acted as a natural filter. Perhaps the juice fermented in these basins or was collected in earthenware jugs and taken to a cellar for fermentation. Today, the process has remained functionally the same, though machines play the primary role and bare feet play only a negligible fetish role in production. Gravity, however, remains a key force in production. 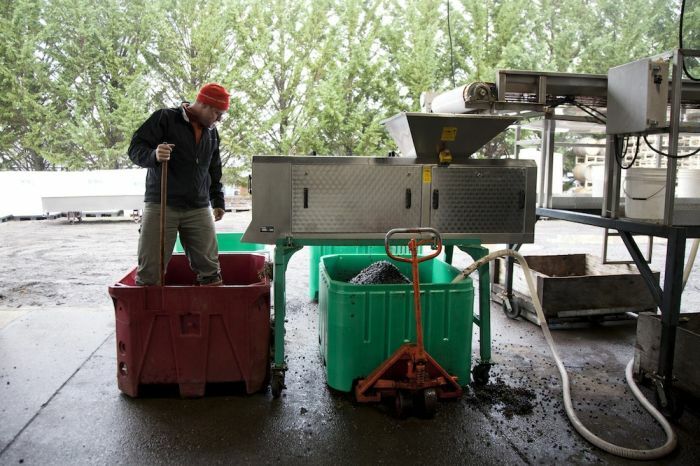 In large wooden or plastic bins, the fruit arrives at Panther Creek by truck and is forklifted onto an electric “tipper,” with stainless steel arms whose angle can be continuously adjusted to allow more or fewer grapes to slip down onto a conveyor belt. 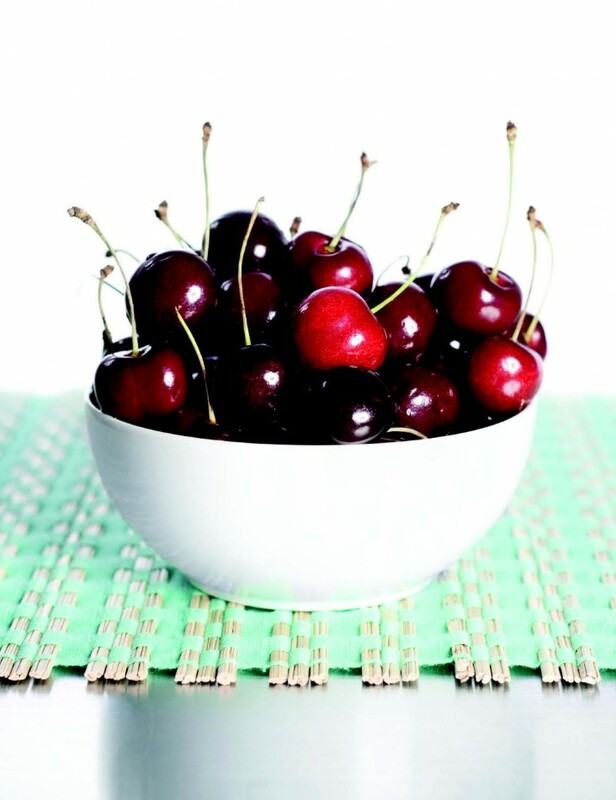 It’s on this production line that crush workers perform their first acts—identifying and tossing out unripe grapes, grape bunches with “ear” clusters that don’t grow as well and those obviously infected with Botrytis, or “bunch rot,” a fungus that kills yeast during the crucial fermentation process. Martha Karson gently pulls the joystick and the perfect pinecone-shaped clusters of Pinot noir grapes roll past her and fall into a machine that crushes them and separates them from their stems. After a splash of sulfur dioxide, used as an anti-microbial and as a perserving agent thorughout a wine’s aging process, the resulting grape juice is then stored inside the facility in large bins, where it will remain until fermentation has run its course. From these bins, Petterson draws wine samples into an arm’s length syringe then takes them back to a small room with a workbench to perform tests and record results. 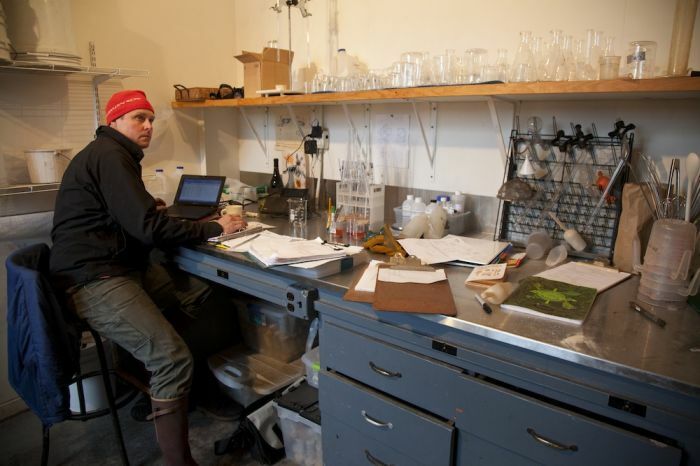 Petterson will check temperature, pH and sugar levels to monitor the progression of the wine. This testing is constant. The fermentation process begins slowly, then picks up velocity and throws off heat in the process. A winemaker must catch this balance at the right moment in the arc of fermentation to capture the wine’s ideal alcohol level. 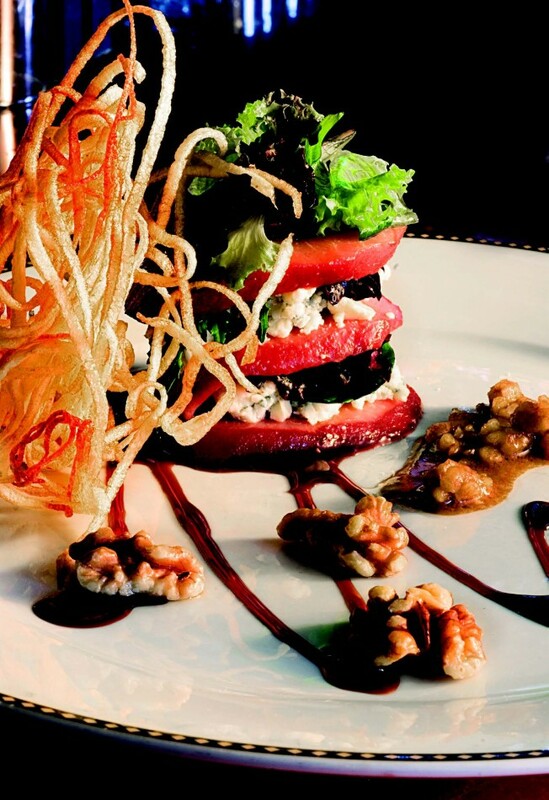 If the fermentation happens too quickly, it raises the temperature of the wine to a level that harmful bacteria like. Too little fermentation and the wine teeters on the sweet side—not a good outcome for a distinguished Oregon Pinot noir. 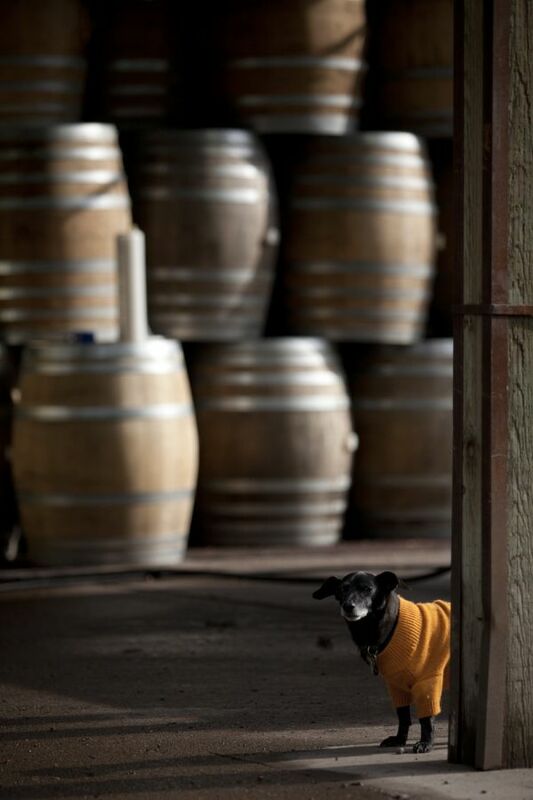 Among these open vessels is where Bailey, Panther Creek’s recently rescued beagle, and cold workers chilled from the crush, find time to linger in the warmth of the fermentation process. In the basins of Pinot noir-in-the-rough, grape skins rise to the surface on carbon dioxide bubbles and form a surprisingly dense pancake, or cap, over the juice below. Not quite wine yet, this combination of juice and skins, called “the must” (from the Latin vinum mustum, or young wine), will remain in open vats until the sugar has been consumed. At least twice a day, winemakers break up the cap of the must on the fermenting vats with a hoe-like implement and force the skins back to the bottom. This physical “punch down” helps keep the skins wet to prevent bacteria buildup, aids in fermentation and helps ensure a consistent and familiar deep red color throughout the batch. Wine gets its color from the grape’s skin. When fermentation is complete and tests show the Pinot noir to be in a range of 12.5 percent to 14.5 percent alcohol, the wine is then moved into oak barrels to age for ten to sixteen months before being bottled and sold. During this time, winemakers will constantly taste the wines to assure their quality. It’s in this phase when a winery will often invite its regular patrons to private barrel tastings to receive their feedback. Finally, winemakers will test the 2011 vintage against the public palate in a moment of truth. In France, the competitive winemaking industry is cloaked in mystery and centuries-old secrets running through their vines. Wine is thicker than blood. 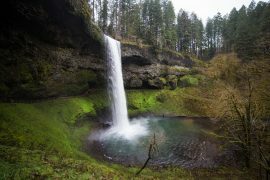 Here in Oregon, the process is less secretive and more of a giant cooperative. The harvest and the crush brings people together for traditional and, at least at Adelsheim, unusual events. 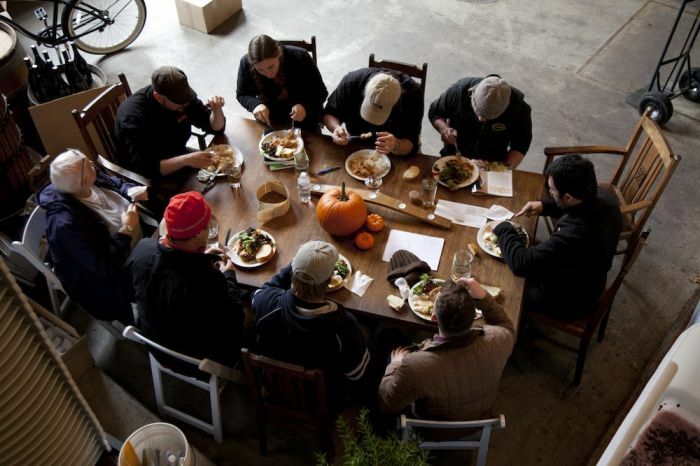 At Panther Creek, many winemakers work together, share ideas and regularly sit down around one large table for a lunch that includes Professor Karson’s wonderful soup from local produce, flakey bread and a homemade dessert. With these meals, the retired psychology professor has learned how to heal the body as much as the mind. 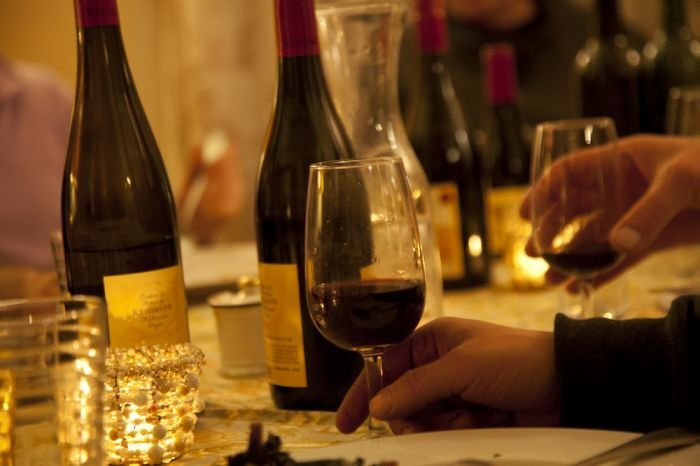 Pinot noirs are the subject around the table as different bottles, as well as other varietals, are sampled and discussed. One of the Stuart children comes up from an errand in the cellar with a mistakenly expensive bottle of wine that somehow slips into general consumption before Rob detects it. One boy’s error is an older boy’s delight. At Sokol Blosser Winery, an old saying speaks of a time-honored tradition. 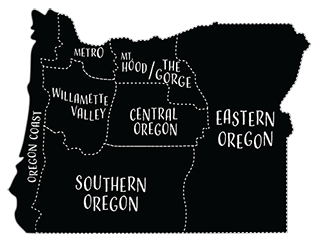 “It takes a lot of beer to make good wine,” says Alison Sokol Blosser. Sometimes the beer is a favorite Oregon IPA, sometimes it’s not. Makers of Oregon’s finest wines can also be found at McMinnville’s Deluxe Billiard Parlor (locally, “The D”) during crush, knocking back the latest vintage of Coors, PBR or Budweiser. Back at Adelsheim, crush traditions are more experimental. A couple of years ago, they challenged the Ponzi Vineyards crew to a crab derby on the coast. The Ponzi crab trappers proved too skilled for the Adelsheim team. Last year, however, the Adelsheim crew changed tactics and found a vulnerable opponent. This began the first annual trampoline dodgeball tournament against the Domaine Serene harvest crew. Gina Hennen, the assistant winemaker at Adelsheim, had the homecourt advantage, having taken trampoline aerobics classes at this Tigard venue. Domaine Serene countered with a sure-handed soccer goalie, a “ringer,” Adelsheim’s Paige contested. The losing team would do the honors at the local bar. In the end, Adelsheim overwhelmed Serene and drank in the spoils. After the last grapes are processed, winemakers are happy to put the anxiety of 2011 behind them. What must have been one of the most challenging years in their careers could further enhance their global reputation as formidable winemakers when the vintage is bottled.